Last season, the ratings for Homeland grew as the season progressed. Can the Showtime series hold onto that success? Will it become a bigger hit or will it be cancelled instead? The second season of Homeland airs on Sunday nights and there are 12 episodes. The cast includes Claire Danes, Damian Lewis, Morena Baccarin, David Harewood, Diego Klattenhoff, Jackson Pace, Morgan Saylor, Mandy Patinkin, Jamey Sheridan, Navid Negahban, and David Marciano. Below are the most recent ratings for Homeland on Showtime. The TV show’s ratings are typically the best way to tell if a series will be cancelled or renewed for another season. Final season averages: 0.8 rating in the 18-49 demographic with 1.92 million total viewers. 0.9 demo rating (-10% change) with 2.29 million (-3% change). Season averages: 0.83 in the demo with 1.92 million. 1.0 demo rating (0% change) with 2.36 million (+7% change). Season averages: 0.83 in the demo with 1.89 million. 1.0 demo rating (+25% change) with 2.20 million (+8% change). Season averages: 0.81 in the demo with 1.84 million. 0.8 demo rating (-11% change) with 2.02 million (+7% change). Season averages: 0.79 in the demo with 1.80 million. 0.9 demo rating (+13% change) with 1.87 million (-2% change). Season averages: 0.79 in the demo with 1.77 million. 0.8 demo rating (0% change) with 1.91 million (+9% change). Season averages: 0.77 in the demo with 1.76 million. 0.8 demo rating (-11% change) with 1.74 million (-19% change). Season averages: 0.77 in the demo with 1.74 million. 0.9 demo rating (+13% change) with 2.07 million (+16% change). Season averages: 0.76 in the demo with 1.74 million. UPDATE: The TV series has been renewed for a third season by Showtime. 0.8 demo rating (+33% change) with 1.75 million (+15% change). Season averages: 0.72 in the demo with 1.65 million. 0.6 demo rating (-25% change) with 1.48 million (-12% change). Season averages: 0.70 in the demo with 1.62 million. 0.8 demo rating (+14% change) with 1.66 million (-4% change). Season averages: 0.75 in the demo with 1.69 million. 0.7 rating in the 18-49 demographic with 1.73 million total viewers. Season average: 0.70 in the demo with 1.73 million. It was a big opening for Homeland. Year-to-year, the premiere was up by 75% in the demo (vs a 0.4 rating) and up by 37% in viewership (vs 1.08 million). 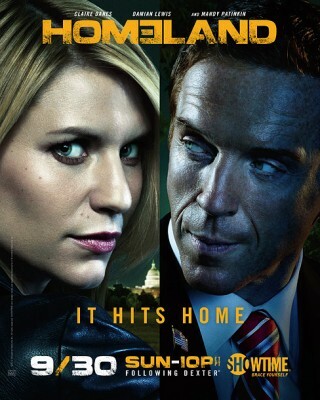 Reference point: The first season of Homeland averaged a 0.5 rating in the 18-49 demographic with 1.25 million viewers. What do you think? Do you still like Homeland TV series? Do you think it should be renewed for a third season or cancelled instead? Happily, Homeland was renewed for a third season more than a week ago. There were tons of news reports announcing that. Yes, as the article update notes. I love Homeland and it should definitely keep going. If this show belonged to one of the non-cable networks, it would probably have higher viewership numbers. The 2nd season for me has been better than the 1st (discounting the flashback scenes). The 2nd season is better than the 1st??? I loved the first season of this show but I am quickly becoming disillusioned with the 2nd. When Carrie was a rouge agent I understood what she was doing and why, but now the CIA is letting her run the investigation? The CIA may be many things but stupid isn’t one of them.